Hey guys, what’s going on? It’s Ash here, coming at you today in Clash Royale. And finally, the Night Witch Draft Challenge is upon us guys. Coming out tomorrow from when I upload this video, we will have a chance to unlock the Night Witch before she comes into the game. You guys are probably already familiar with the one-time Tiered Rewards System. After 12 wins, you will get the Night Witch. You have one free entry. You guys, as I said, know the drill by now. We’re going to have some fun. See the first ever Night Witch gameplay on my channel against Clash With Cam. I’m going to go with Lightning. I’m going to go with Hog Rider for sure here. And then we’re going to go ahead and combo it with Tombstone, for sure, and Baby Dragon. This is a really good draft for yours truly. Now I want to let you guys know that I’m also putting out a video at the same time as this video, where I share my three favorite Night Witch decks against Clash With Cam. I’m taking the Night Witch and putting her in three of the best Tier 1 decks inside the Meta Lavaloon. 2.9 Miner Poison. A little bit more expensive because of the Night Witch. And lastly, we put her in splash yard. So, you’re not going to want to miss that one. I put two videos out because it didn’t seem natural to go from a draft to meta decks. So hopefully you guys like the format here. We’re going to keep things short and simple here. You can see this draft pre-recorded obviously. I was able to predict that miner. Feeling really good about this start. He didn’t have a natural counter, a hard counter, to the hog rider, at least in his starting hand. So, I liked that. I feel really good about the fact that I drafted the lightning; because I can take out his witch if he plays her anywhere near that tower that I’m focusing on. This is the first Night Witch that I’m ever dropping, at least live on the channel. I’ve been playing the Night Witch for quite a while now. 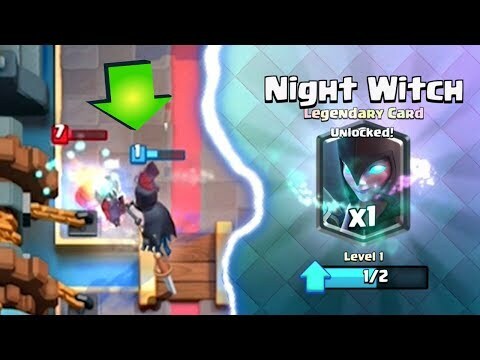 I’m a big fan of Night Witch. I think she’s going to be really strong guys. When she dies, she spawns bats. So, pay attention to when she dies right here, guys. Look at those three bats. Boom! No big deal. Extra value. I think value is the key phrase that you’re going to want to keep in mind when talking about the Night Witch. A legendary card. She only cost 4 Elixir. I think that people are going to have a tendency to compare her with the traditional normal Epic Witch naturally. She in my mind holds so much more value. She has the unique ability of being the only troop in the game that spawns air units. When you put her behind the King Tower, they’ll spawn in different directions. That’s a cool little mechanic I guess? That actually is really valuable. It gives you a little bit of defense in that opposite lane. And you can even combo that with something like a Bandit or a Hog Rider in the opposite lane to take your opponent by surprise. So here comes the Night Witch doing her thing there. She dies. A couple more bats are spawned after her death. And again, nice lightning in here. Just what I talked about there. Getting that lightning, on that witch, whenever Cam plays her. Unfortunately, not able to predict that miner, but I’m still feeling pretty good about where this match stands right now. And I know everything that Cam has at this point. I want to try and get a pretty aggressive Lumber Jack/ Hog Rider combo right now. Just need this lightning! And here it comes. Lightning baby! And that is what you call a “value lightning” guys. It took out the witch and Spear Goblin hut. And of course, I hit the tower that I’m aiming for. I haven’t seen any direct damage at all from Cam except for those arrows. So, I’m not scared to play my Night Witch in the same vicinity of my Right Crown Tower. The one that he’s targeting. Of course, I have to stop this big offensive surge first. Another good lightning here. He places the Spear Goblin Hut way, way, up towards the river. A smart placement there, but unfortunately, I was ready for it. And the lightning, easily still able to take it out here. At this point, I’m a little scrambling. I know he’s going to have the Mega Minion play at the bridge. So, I have to distract it. The tombstone is great at distracting the Mega Minions, spawning those skeletons after its death. And again, Cam says “GG” here, and I know it’s in the bag. I really, really, like the Night Witch of course. Again guys, if you want to check out my other video I highly recommend you do so. It’s going to show a lot more game-play of the Night Witch and a lot more strategy. You know, tactics and techniques that you guys can use. Before I let you go, here are all the rewards that you get along the Night Witch Draft Challenge. You can see the first reward is a gold chest. Then we have golds, a magical chest, 25K gold, and of course, the Night Witch. So, guys, thanks so much for watching. Huge shout out to my YouTube partner Bren Chong. You can find his information in the description below. Make sure you check out that other video. And as always, take care guys.